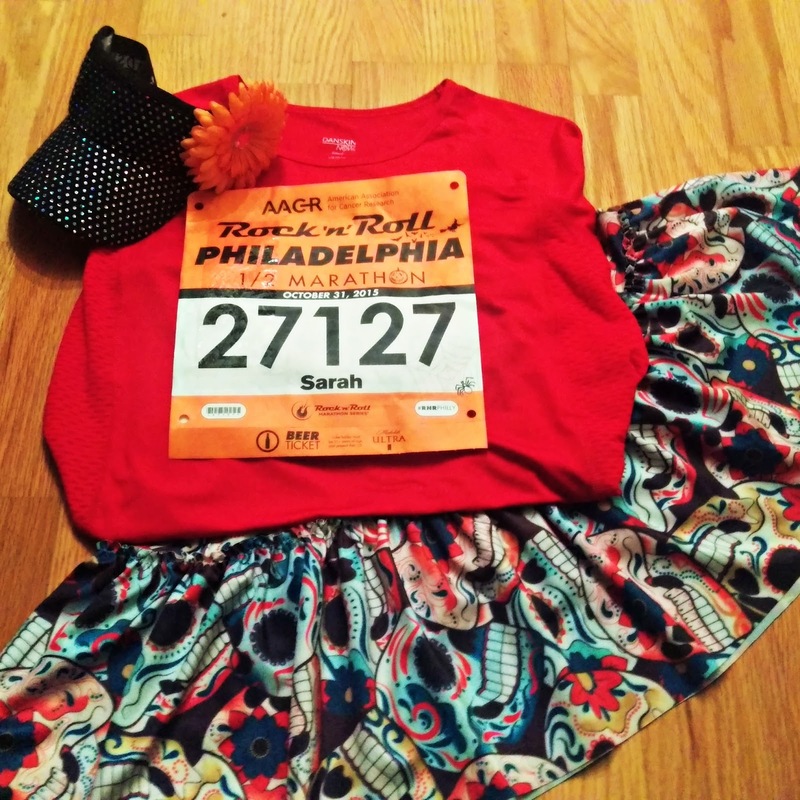 On Saturday, October 31st- Halloween- Matthew and I ran the Philadelphia Rock 'n' Roll Half Marathon, also known as RnR Philly. We'd run this course once before in September 2012. 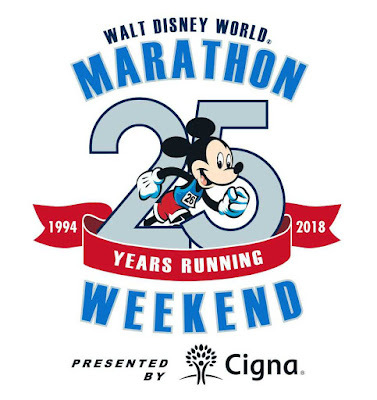 It was actually my second half and my first non-Disney half marathon. 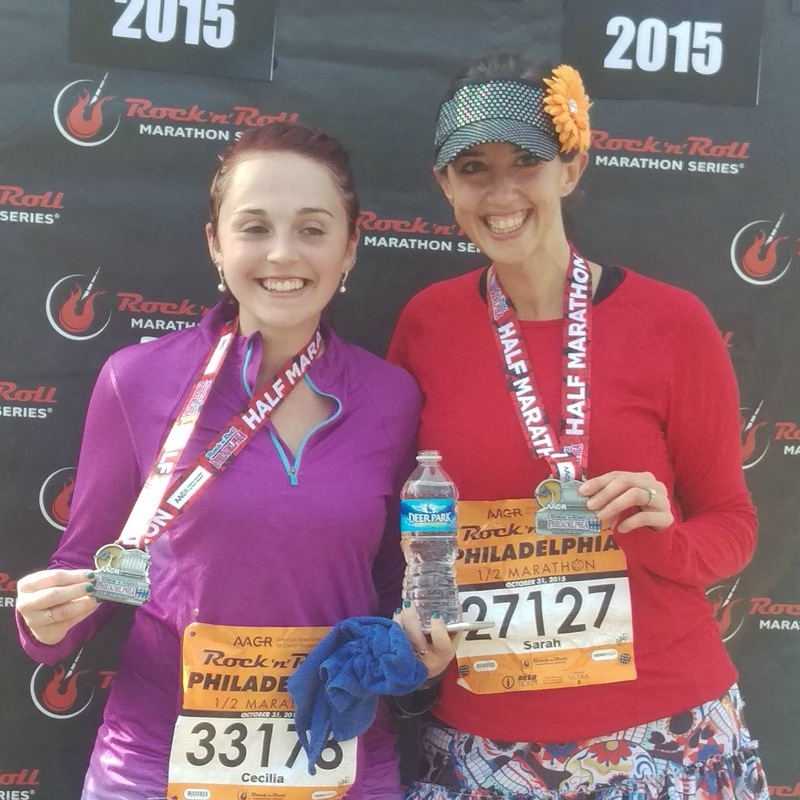 We actually registered for the race before RnR had selected a date so we got a low price: $65. Traditionally, this half is the last weekend in September but this fall, it coincided with the Pope's visit. So they eventually moved the race to a Saturday in October which just so happened to be Halloween! We took the day off on Friday because it takes about three hours for us to get to Philadelphia from where we live. We drove straight to the expo, held at the Philadelphia Convention Center. If you do this race, be prepared to pay $20ish bucks to park near the Convention Center. Whomp whomp. Anyway, this expo, as with almost all RnR races, was large and full of cool vendors and products for runners. We walked around collecting our bibs, official t-shirts (they ran a smidge small), and free samples. 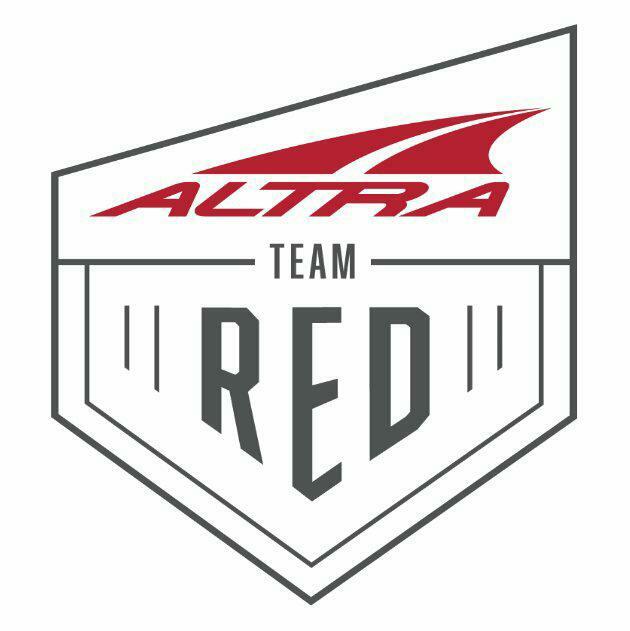 Matthew won a cool shirt from the Brooks booth and I bought a new pair of Altra Olympus for $65! After the expo, we headed back to a friend's house (who graciously hosted us for the weekend!) for a home cooked meal, some wine, and a good night's sleep. On Saturday morning, we had to drive about 15 minutes to the race start so we were up, dressed, and out the door by 6:00 am (race start 7:30). It was pretty chilly, around 39 degrees so I opted to wear a pair of shorts, knee-high compression socks, tech short-sleeved shirt, tech long-sleeved shirt, ear warmers, gloves, and a Sparkle Athletic skirt. I also wore a sweatshirt and a pair of sweatpants that I planned to throw away once I got warmed up. 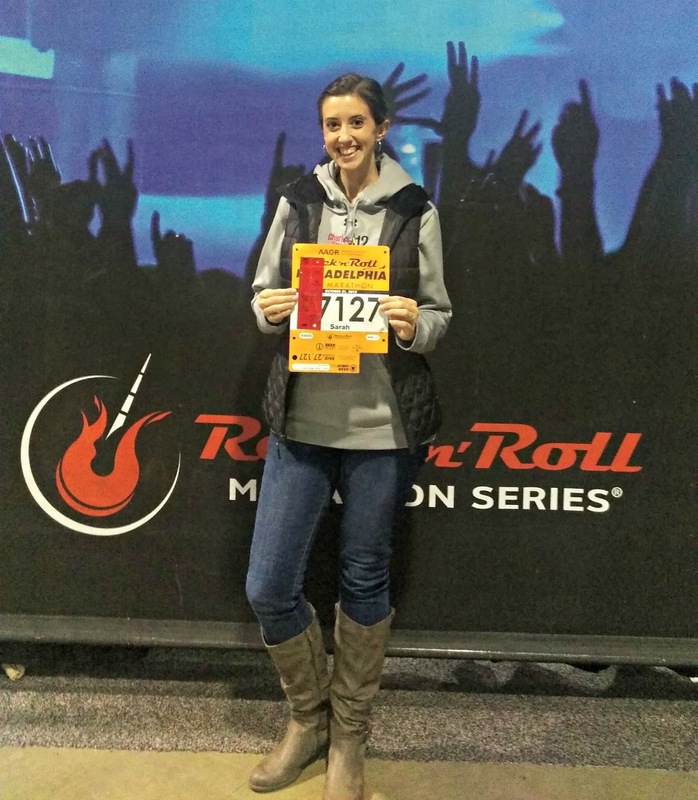 We easily found cheap (around $8) parking in a well-lit garage semi-close to the start line. Because it was freezing and we were hungry, we found the closest Wawa (my all-time favorite!) and grabbed some breakfast and some heat. Eventually, we knew we'd have to get to the starting line. So we headed back out into the cold to find a bathroom and get closer to the start line. 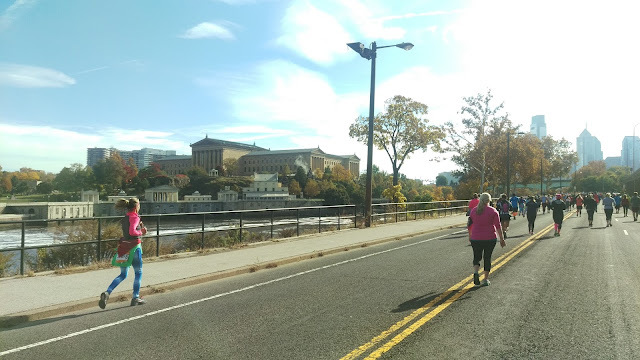 As we got near the start line (near the Philadelphia Museum of Art aka the Rocky steps), I started looking for our friends. 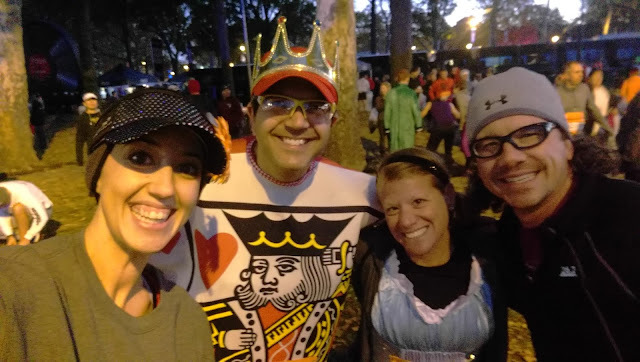 We had hoped to meet up with Kathryn from Dancing to Running, Liz, and Cecilia- all people I've met on the internet :-) We just so happened to run into our run Disney friends Ian and his wife, Shari. 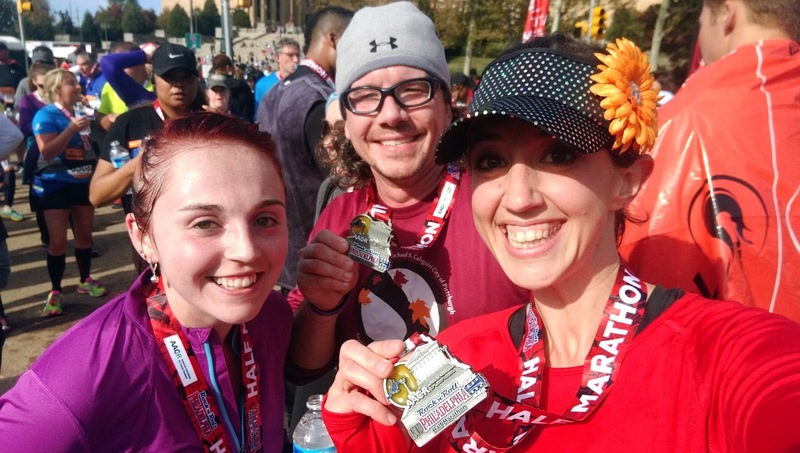 We actually "met" Ian in 2013 when he hosted a virtual run to raise money for Autism Speaks, the charity he was racing the Goofy Challenge for in January 2014. Since then, we always seem to run into him at Disney among thousands and thousands of people! Me, Ian, Shari, and Matthew. Or should I say Me, the King (?) of Hearts, Alice, and Matthew. 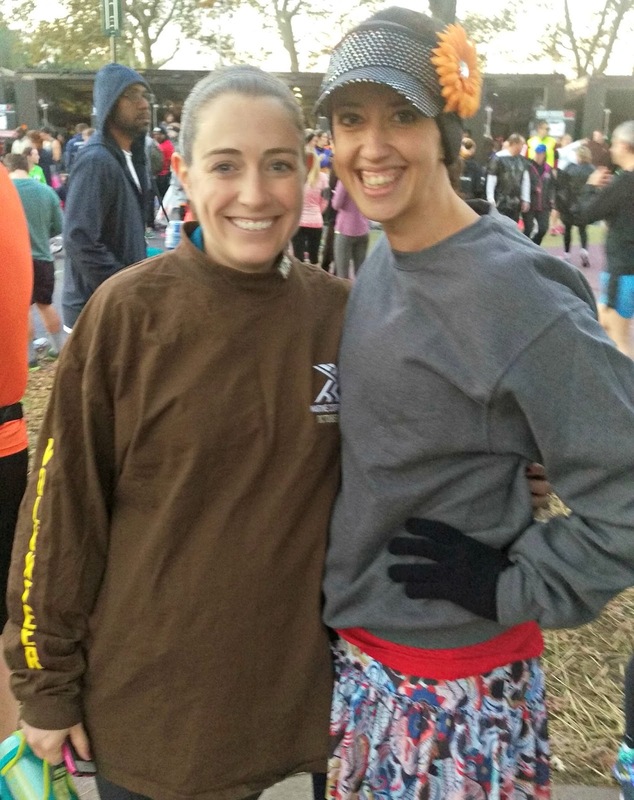 I'd been texting with Cecilia and we agreed to meet her in the corrals right before the start. We went off in the direction of bag check (which we didn't use) to find Kathryn who was running this race seven months pregnant! After chatting with her for a few minutes and catching up, we headed back to the corral as the race was getting ready to start. Congrats to Kathryn (and hubby Preston) on the December birth of her healthy baby boy! Finally, we walked over to the race start to meet Cecelia. As we were catching up and slowly moving forward (we were in corral 22 of 37), we ran into another friend from the internet, Liz! She blogs over at InTheLongRun. What a day for internet/running/blogging friends! We look pretty good for it being so cold and early! At long last, it was our turn to start the race. 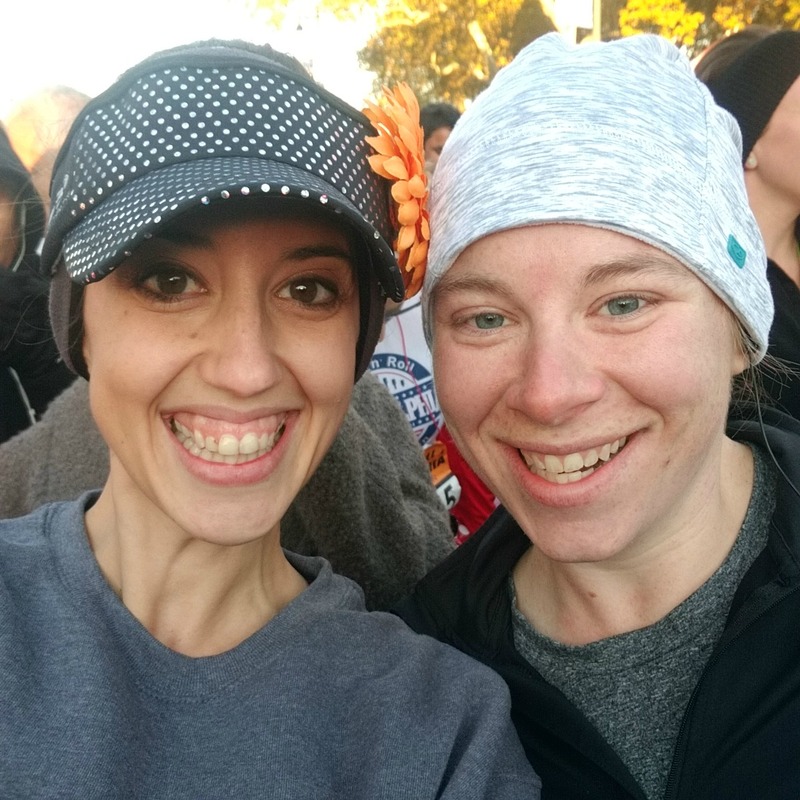 This race did an awesome job of playing upbeat songs to keep our energy level high- especially with the occasional Rocky theme song thrown in here and there. Since we'd done this course before, we knew what to expect: flat, beautiful course with a long, slow uphill at the end and little to no crowd support after mile five. We used 30:30 intervals for this race and we hoped to finish somewhere in the vicinity of 2:45. Matthew, Cecilia and I agreed that since we all felt under-trained we were going to approach this race slow and steady. 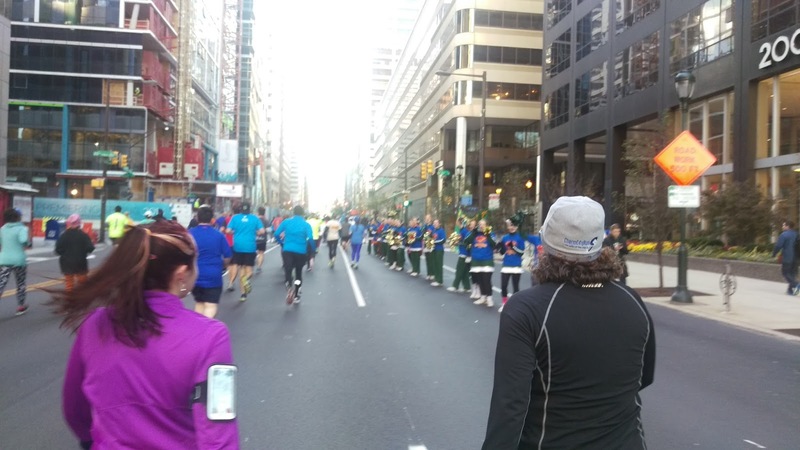 The first few miles of the course all run through downtown Philadelphia and are very, very flat. The crowd support through this area is awesome though and it really makes for such a great experience. As we rounded one corner, we were serenaded by a man singing the Eagles fight song and then treated to this awesome spectator sign: "Witch betta have my medal!" Cecilia and Matthew making their way through mile two. RnR also treated us to some fun signs! After passing the Art Museum again around mile 5, we headed out on Kelly Drive. This section of the course is beautiful and the race organizers did a great job in having entertainment every mile or so during this stretch. It's pretty lonely as far as crowd support but there were local cheer squads and even a group of cyclists that were standing on the sidelines and cheering. We kept our pace nice and steady- Matthew would just give me a sly thumbs up every once an a while to let me know we were ahead of pace. He had a 2:45 pace bracelet on (that he got at the expo from the pace team table) and was mentally calculating where we should be at each mile to be under 2:42. By the time we hit mile 11, we let Cecilia in on our little secret- if we kept up this pace, we'd crush her PR. We ran under the "rock star's legs" (I remembered him from years ago and knew we were getting close) and tried to pick up the pace just a little. Side note, there were not as many costumes as I expected. 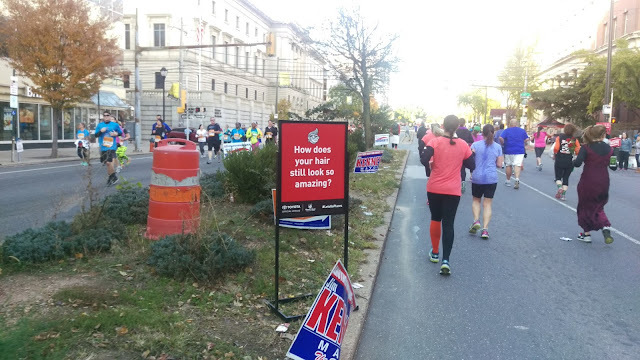 Because this race fell on Halloween, I expected that almost everyone would be dressed up. But, it's not a Disney race :-( I'd say probably one out of every ten runners was dressed up. The best costume I saw was a women dressed as Elliot from E.T. Super creative and well-implemented! There is no caption for this creepiness. 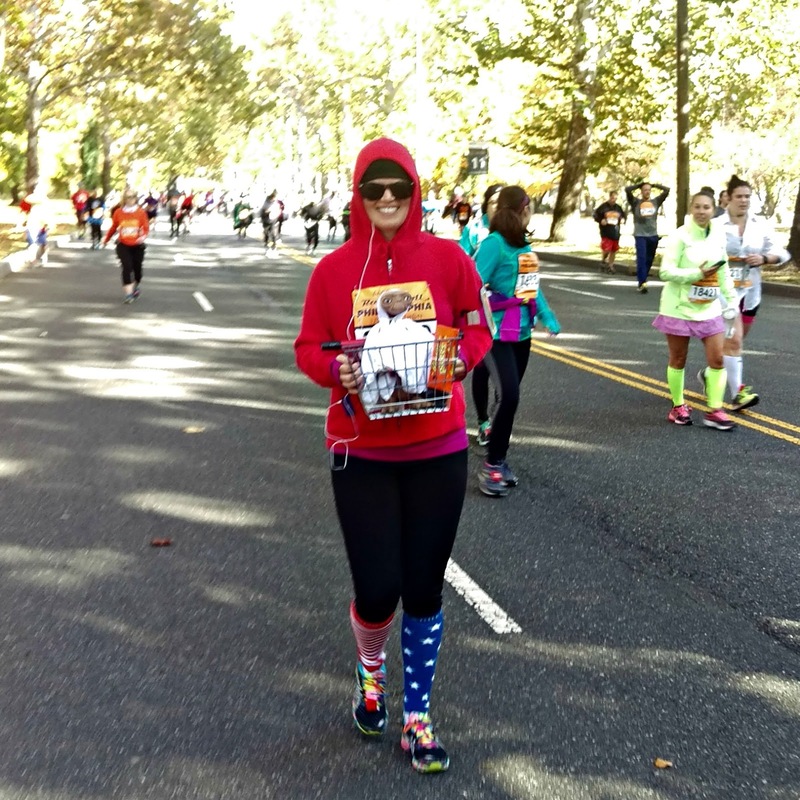 Seriously, she ran in a full hooded sweatshirt with a bicycle basket, E.T. and a box of Reese's Pieces for 13 miles! The last few miles of this course brings back awful memories for me. From mile 11.5 to the finish, there is a slow-grade uphill that just beats the hell out of you. When this race was in September, it was really hot and there is ZERO shade on this part of the course. You can see the Art Museum but it feels so far away. But this time, I knew it was coming. Matthew and I had prepared Cecilia for it so we just put our heads down and got to work. The finish line... so close and yet, so far. Finally, we sprinted up the last little hill to finish in front of the museum. Matthew stopped his watch. 2:39:23. 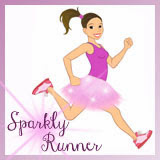 Cecilia had a shiny, new, unexpected PR! I can't even describe the feeling I had at the finish. It is always amazing to cross the finish line with Matthew but this time the victory of the finish was 10 times sweeter. After my DNF a month prior in Akron- then coming in with Cecilia to her fastest half marathon EVER- and crossing the finish line with my future husband- it was just the coolest thing. 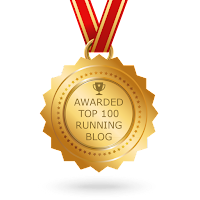 I'm crying right now writing about it :-) There is just something magical about running and racing that makes all my emotions feel bigger and better than they ever have. Finisher smiles are the best smiles. Will we do this race again? Sure! 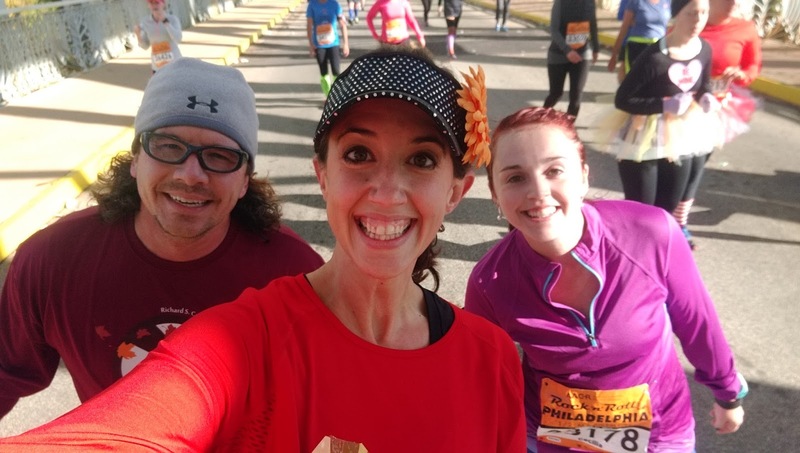 Matthew lived in Philly for 10 years so we're pretty familiar with great areas to park and how to get in and out of the city quickly- two important factors in deciding to do a large, urban race again. The course is flat, there is a lot of crowd/race support, and the atmosphere of this race is generally laid back and fun. And the course along Kelly Drive is just beautiful, no matter what time of year. For 2016, this race has moved back to September. 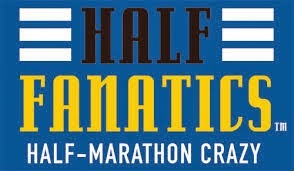 Currently, the price is $35 for the 5k on Saturday, 9/17 and $75 for the half on Sunday, 9/18. If you're looking for a big race on a flat course in a historical city, this may just be the one for you! Close up of the medal and bib- I really liked the Halloween theme. 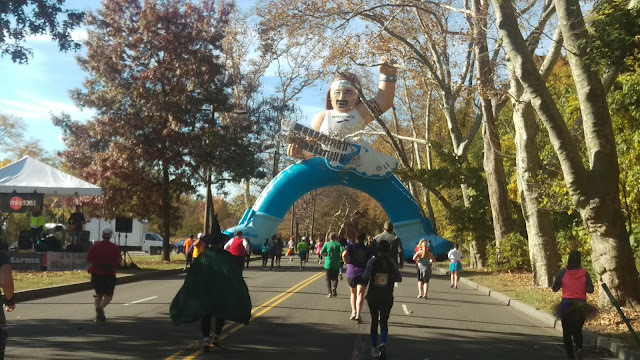 Have you ever run a Halloween race before? Did you/would you dress up? I'm so glad to know there was a reason I was especially hurting from mile 11.5-end. I actually didn't realize it was a slow incline! Those last few miles were especially tough and I blamed the fact that I felt I was undertrained. But in the end I set a new PR of 2:04! Knocking 7 minutes off my PR!!! 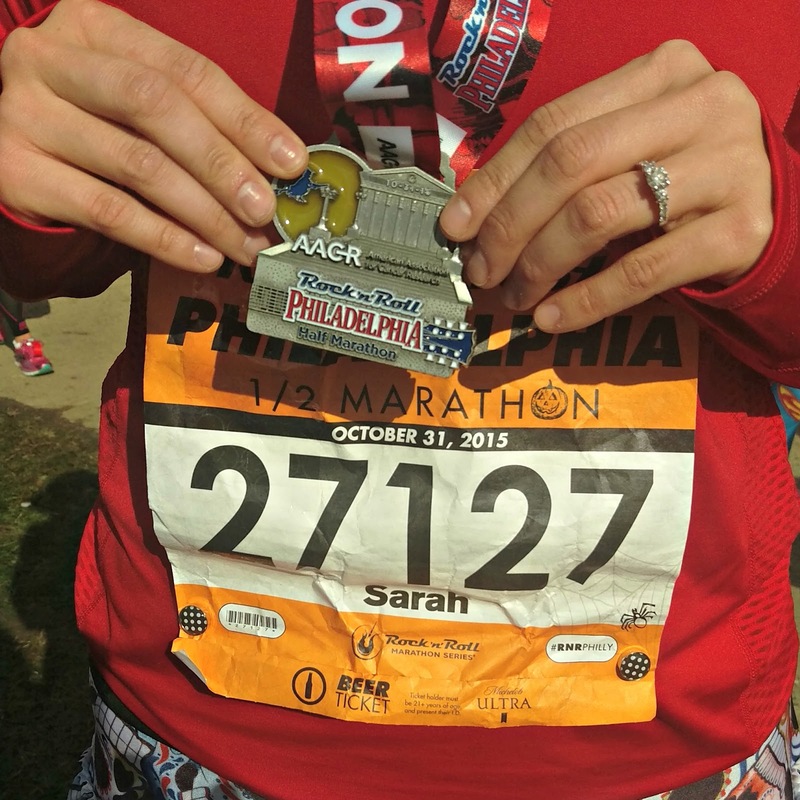 I might go back in 2016 just to take a stab at running a sub-2 half. Love your skirt!~ I'm a huge fan of sugar skulls.